What a fabulous time I had wandering in a state of overstimulation at this year's NW Quilting Expo this past weekend at the Portland Expo Center. Maria joined me for the initial PMQG meet-up, but then we got so eager to get started we kind of separated from the group. We decided to begin by viewing the quilts in the exhibit, then doubled back to look at all of the goodies that the vendors offered... and where better to start than with our guild's mini-exhibit! Following are a few that I wanted to document, though do not be mistaken, I loved most everything there! (designed and pieced by Brittany Scott, quilted by... can you guess it??? Nancy Stovall!) Brittany's quilt was not technically hanging with the rest of the PMQG exhibit, but we do call her one of our own so I include it here! And then, of course, I had to take a photo of my own quilt hanging (Maria wanted to take a pic of me standing in front of it, but that was an honor I happily declined). (mine on the left... designed and pieced by yours truly, quilted by the lovely Melissa Hoffman). Next I'm going to share some of the quilts that stood out to me in the general exhibit, though unfortunately I have to edit so that this post doesn't get unwieldy. (designed, constructed and quilted by CarolAnne Olson... in conjunction with the "Cover to Cover" quilt group illustrating the classic Peter Pan). (pieced by Cristina Pera, quilted by Elegant Expressions, pattern by Pie in the Sky)... this pattern, Bouillabaisse, has been in my possession for many years - one of those that I loved at first sight and is a perfect pattern for using scraps and strings! Phew! My feet are killing me just revisiting the photos and labels! That must be why we felt it necessary to break for snacks before continuing on to shop. In that respect, even though the post will be considerably shorter, I think it's wise to leave the vendors info until a later date... but tune in and you'll get to see my swag!! Friday's theme turned out to be "improv." I ticked 2 small projects off the list, though it took several hours to do so, much of that time just pressing and cutting up little bits of fabric. 1.) The May block for Design Camp 2 [Think outside the block] swap. The packet of fabrics I received from Mims contained beautiful warm cinnamon tones with a hint of yellow. 2.) The improv challenge block for PMQG. I think I needed a day of working intuitively. I might need one or two more days like that, but even more importantly, I think I need to get back to making lists, since today I spent a few hours just catching up on pressing fabric and didn't touch a sewing machine or cutting table at all. Tomorrow, tomorrow, tomorrow. This post is kind of a combination / culmination of an honor that was handed to me earlier this week and a really nice day spent with the Portland Modern Quilt Guild members sewing away at Fabric Depot. A new Flickr friend, Karen, whose work I've admired over the past year or so since becoming more active on that site recently started her own blog: CapitolaQuilter. We've been members of the same online bee since the beginning of the year (Friends+Fabric=A Modern Stash Bee) and it's been such a pleasure so far! And inspiring. Very, very inspiring, which is also a word I would use to describe Karen's energy and gusto in getting her blog off the ground. Apparently I was not alone in that assessment, as another of her friends bestowed upon her something called "The Liebster Blog Award," something I had not heard of before Karen passed this on to me. 1. Thank my Liebster Blog Award presenters. 2. Link back to my presenters' blogs. 3. Copy & paste the blog award on my blog. 4. Present the Liebster Blog Award to five blogs with 200 or fewer followers that I feel deserve to be noticed and post links to their blogs on my blog. 5. Let the recipients know they have been given the Liebster Blog Award by posting a comment on their blog. For some reason this caused me some stress. I can't say why. I'm weird like that. And then today I spent the better part of the day hanging out with other members of PMQG, working on our respective sewing projects, chatting about all sorts of things, and I was reminded that this is a pretty cool group of ladies and I'm fortunate to have found a place among them (though I still feel kind of like a wallflower much of the time!). And I was reminded of Karen's generous compliments. It's time to pass that on, though I might be changing course ever-so-slightly. So, here is my list of artists and creators to keep your eye open for, and maybe check out what they have to share, because I know that I get something from each of these folks! Connie at Oui Chef: a Journal. I'm going in a different direction to begin with. Connie is not a quilter, in fact she doesn't sew at all. She's a talented chef and just as talented a photographer, as can be seen on her blog or her flickr page. Unfortunately she's slowed down on the blogging this year as I believe her professional life has been taking up the majority of her time and energy, but all it takes is reading a few sentences and you KNOW how passionate she is about the dishes she makes and the tools that she uses (illustrated so well in one of my favorite posts, found here). Jenn at jenn of all trades. I first came across her drawing and illustration work on flickr before I even realized that she is a quilter and seamstress too. And as I came across more of her work, the more intrigued and inspired I became. She seems to have an amazing outlook on life and I so appreciate many of the general encouragements I come across while reading her blog. Just check it out and you'll see what I mean! Gail at I Think Sew. Gail has become like a beacon of sunshine and light in grey ol' Portland. She's been a welcoming presence both at local guild meetings and events as well as in the flickrverse and blogland. She has a vision that seems to be truly and uniquely her own (which I find so refreshing!) and always kind words for other's work. Think: positive karma. Rebecca at Sew Festive Handmade. It isn't hard to get a sense of just how interesting, well-rounded and humble this young woman is by reading her blog posts. She seems to be someone who takes things as they come, sees the beauty in all sorts of things and enjoys creating more. I admittedly am not the most frequent blog-browser, but usually when I see that Rebecca has a new post, I'm interested to see what her day has brought her. Michelle at Design Camp. Another PMQG member, I've enjoyed not only seeing her dedication to quilting develop over the last year or so, but love her innate ability for instruction and aid. My understanding is that she's been sewing and in textiles for years, and set up the blog moniker for teaching sewing to youths, but I feel that in almost every conversation I have with her regarding sewing I learn something new, or at the very least see a perspective I might not otherwise have seen. That's awesome. I think she has a lot of great ideas and experience to share as well as a sense of adventure and curiosity to try new things that I admire greatly. I hope you all will give these ladies a nod, and get a little something from your visits. This is getting to be an "every other week" thing for me (I guess one could say fortnightly, as opposed to weekly). But I was still over at Lee's blog Freshly Pieced last week checking out what other people had posted, and I suggest anyone here do the same! And today I will be linking up with the goings on. Well, new to me anyhow. Blogged a bit more in this post. I'm still thinking about other possibilities, but have come to a bit more peace with this block than I maybe showed in this post (in no small part thanks to the lovely comments folks have made over on Flickr). Working with someone to hopefully supply her wedding reception... fingers crossed it pans out! I just don't have a table in my house clean enough to properly photograph! Going to try and do it while at work today at the quilt shop... Marie has those gorgeous wood cutting tables over at Cool Cottons!! Nothing really new or exciting to write about. Still haven't basted this puppy... heading into the studio after spending the previous afternoon weeding does not inspire one to spend another hour or two squatting on the ground. At least my back and legs felt that way! Both of these projects are blogged about a bit more here. After a thoroughly informative and inspiring visit from Kathy Miller, co-founder of Michael Miller Fabrics, during our February Portland Modern Quilt Guild meeting each of the guild members was generously supplied with 8 fat eighths of their new line of Cotton Couture Solids. Now, one could treat this as a lovely gift, no strings attached, but the real gift in it is actually a design challenge. Any member who chooses (and there have already been a few, uploading photos to the PMQG flickr page) is invited to design a 15"x18" pieced block using the cotton couture fabrics with which we were supplied and Kathy Miller will select about 16 blocks to be included in a quilt that Michael Miller will feature in their booth at Spring Quilt Market in May 2012. I should have prefaced this post by saying that I found out this week that I did not have a quilt chosen to be part of the MQG Showcase at Fall Market in Houston this year. And so it goes. However, this information was a bit disheartening (although not at all surprising!) and at the same time is forcing me to endeavor that much more to make an impact. But I don't know quite how to do that. I went ahead and pieced a block, which I think turned out well, but not sure that it's a "challenge winner" (especially after seeing the blocks showing up in the group pool). so, being the person I am, I'll be making one or two or four more blocks, over-thinking all the way, and have NO IDEA what they're actually looking for, and likely miss the mark. Is this what it's all about?? At our last PMQG meeting, Michelle of Design Camp PDX gave a fabulous talk and demonstration on improv piecing, inspired by a class she attended with Denyse Schmidt and projects she's pursued since then. One of the visual examples she brought to the meeting were blocks constructed by members of the guild at a sew-in exercise a month or two prior. Not having been at the sew-in when these guys were originally made, at the end of the meeting I volunteered to "inherit" the blocks in order to piece them together into a quilt top that will then be quilted by Nancy of Just Quilting, and donated to the guild's chosen March charity organization, Quilts of Valor. They have now been up on my design wall for the better part of the week, and I still have not approached them. For various reasons, mind you, but I KNOW that when I take them down and set my scrap baskets by me it will be hours of madness! I think the good kind of madness, not angry or frustrated, but madness nonetheless. I've been needing some clean finishes first, I think. And thankfully, I currently have 3 small binding projects at home with me for the next few days, then I might be ready to dive into the scraps! WIP Wednesday - it's been a whirlwind! I seem to have missed last week's check-in and link up over at Lee's blog, Freshly Pieced... which means this entry might be a bit on the long side of things. That's good, right?? So, after checking out my doings, head on over there and see what everyone else is up to on this WIP Wed! fun pinks and oranges in Drunk Love log cabin blocks were Amanda's choice. Can't help but LOVE the fabrics that Yolanda is using for her quilt! Gorgeous, rich tans and taupes, even a linen and crossweave thrown in there for depth and texture. I still have some fabric substitutions to work in, but might start snuggling under this thing right around May or June, just in time for temps in the 70s! The colors AND rules for these challenges are surprisingly similar, though I have been playing with a few different designs, thanks to EQ7! do. Good Stitches November Bliss quilt. One more quilt top off the pile of "unquilted"
Okay, so it's just a little wall hanging, and it still needs the binding on it, but it's been quilted and will be finished by tomorrow evening - that's a PROMISE! I decided to sash these blocks (obviously)... which I made using the same technique that I used in my Tangerine & Wine quilt. But now I think it also needs a border... so stay tuned! I have two possibilities just waiting for the next load of laundry to run! another project from the UFO vault! As I've been glancing at several other people's WIP Wednesday blog postings I've learned that I am far from the only person who has been down with some winter bug or other. That's just such a bummer all around, so I am sorry for all of you out there feeling crummy this season - hope you get your health and spark back soon!! Then, yesterday after spending Friday-Sunday not leaving my home, and Monday taking it somewhat easy, I got back to the studio and got the rest of this put together. Still have to trim the left side and bottom before basting and quilting, but glad to have gotten this thing together. It's a bit busier than I had anticipated, but hopefully won't be too much for whomever ends up receiving it in the end! And just out of curiosity, who else is participating in this round of the For the Love of Solids swap? I wrote a short post about my progress a couple of nights ago, found here. So far I've gotten a couple of sketches done, and was able to gather some fabrics yesterday and today to play with. Is it looking bright and rainbowy yet?? Unfortunately, that's about all I have! I did bring with me to work today the oval template for the Encapsulated quilt and some freezer paper to trace onto, so hopefully I'll be a couple of steps closer to a finish for next week! Oh, and I made a commitment and counted the actual number of finished quilt tops I have just waiting to be quilted (including a couple of minis): 15! OH! And I took it upon myself during my down time on the couch to sort through my baskets and bags of yarn and knitting/crochet projects... we might start seeing a few of these popping up from time to time, too! 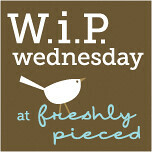 Now, scoot on over to Freshly Pieced to check out what the others are reporting this WIP Wednesday! For Design Camp [think outside the block] 2, Michelle, the wonderful organizer and a fellow PMQG member, started our group off with a dry run this month. For a few of us this is our first improv quilting bee, and I think it just worked out that January was still open after the schedule was put together, so Michelle gave us some scraps of fabric (left over from our guild's Jay McCarroll challenge quilts last fall/winter, seen here and here) and a suggestion for a first exercise. At the same time I have been trying to come up with 2 more blocks to make to work into my quilt from the 1-month Nubees block swap I participated in several months ago. I realized that by taking out the warmer colors of scraps, and using a grey as the "sashing" this block would fit in perfectly with the others I received back in September or October. Now, to play around with that last block - getting much inspiration from a couple of books I just received for the holidays... more on that another time. I got to spend my Thursday working in the sewing studio, but again feel like I was less productive than I'd have hoped. However, I did manage to finish 4 out of 8 of my 6.5" blocks for October's Seams Perfect Bee. Becky pointed us toward a quilt from Karen Griska, highlighted on her blog, Selvage Blog. Without a doubt it is an extremely effective and eye-catching quilt, but I have to admit I did not have fun trimming all of the strips down to 1.25" and fussying the seam allowances (though, I wasn't really TOO fussy, honestly). However, I am sure that some folks didn't love the technique that I chose for my month, so I was happy to do this for Becky!! I managed to get the strips cut for the next 4 blocks (hopefully enough of them), but have put off the piecing until another day. Unfortunately that's not all that I put off as of yesterday. I had been planning to go to the guild meeting for the Portland Modern Quilt Guild (PMQG), but by 5:30 I was going through my new box of tissue at a rapid rate, and my energy plummeted, so the idea of hanging around an hour just to go downtown for a 2 hour meeting didn't jibe with me. Which is really too bad since I missed last month's meeting, and I'll be out of town next month. This also means I won't be participating in the holiday swap, but that's how life is sometimes, no? At the beginning of this summer, The Modern Quilt Guild presented a challenge in conjunction with Freespirit Fabric using Jay McCarroll's newest collection, Habitat. The challenge is relatively open-ended, allowing each guild chapter to define its own goals, but keeping to a few set guidelines. Each member who wishes to participate is given 6 fat eighths (approximately 9" x 22") of different prints from the Habitat collection. The individual does not need to use ALL of the fabric, but if he/she wants to supplement, it must be using only solids or other prints from the same collection. The Portland Modern Quilt Guild asked its participating members to each sew one (or more, if they like) 12" finished block, any design. At our September meeting the blocks will be collected, and ultimately be pieced into donation quilts. While working on another project entirely, I came up with a kind of improv-flying geese idea, and sketched something out. Though I am not unhappy with this, I wasn't sure if it shows enough contrast, so I tried one more using the same designers' fabrics, but selecting a couple more solids and contrasts to see what would happen. I was pretty happy with the outcome. I still have plenty more of the complimentary fabrics, I just don't know about time, but I definitely think I'd like to make a couple more of these, and if I really get my act together, I'll take more process photos and put a tutorial up. I had taken photos while making my first of these blocks, but in subsequent tries, found better and more uniform ways of doing it, so I think I need to fine tune a bit. But I have to say, I do like me a challenge!